- CAD outlook dims after oil collapse challenges BoC outlook. - Oil bust results from economic concerns and Kashoggi scandal. - CIBC sees USD/CAD holding losses into year-end as GBP/CAD rises. The Canadian Dollar outlook has darkened this week after a spectacular collapse in global oil prices, leading analysts at Toronto-headquartered CIBC Capital Markets to cut their year-end forecast for the Loonie. The global oil market has gone from boom to bust within just a handful of weeks, erasing 2018's earlier gains for international prices and giving Canada's own oil benchmark a helping hand down to fresh record lows. Brent crude oil, the global benchmark, has fallen 20% from $80 per barrel in October to just $64 in November and now trades at a -3.45% loss for the 2018 year. Western Canadian Select has had an even worse time. 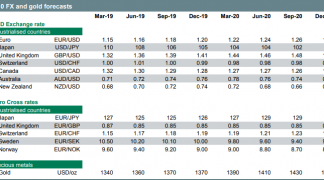 "Although weakness in both WTI and WCS has tempered expectations for a December Bank of Canada hike, a modest further dose of hikes could be on the agenda in early 2019 if OPEC sufficiently curtails production. But the loonie will track weaker than we earlier thought until that happens," says Avery Shenfeld, chief economist at CIBC Capital Markets. Above: Oilprice.com graph showing Canadian oil price. Concerns about the global economic outlook and sanctions waivers for some countries buying Iranian oil have played their part in taking wind from the market's sails, but the most significant driver was the White House on Tuesday. "Saudi Arabia — if we broke with them, I think your oil prices would go through the roof. I’ve kept them down. They’ve helped me keep them down. Right now we have low oil prices, or relatively. I’d like to see it go down even lower — lower," President Donald Trump told reporters at the White House Tuesday. Trump has frequently hit out at Saudi Arabia and the Organization of Petroleum Exporting Countries (OPEC) over their efforts to manipulate oil prices in favour of producer nations, which could've led traders to conclude he's struck a deal with Saudi Arabia trading protection of the Prince for lower oil prices. "The market linked the two and is, reasonably, now risking the effectiveness of a Saudi led OPEC cut," says John Rigby, an analyst at UBS, in a note to clients. The White House has been under pressure to respond more forcefully to allegations Saudi Crown Prince Mohammad bin Salman ordered the extrajudicial and extraterritorial execution of journalist Jamal Kashoggi, who has been described by Saudi Arabia as an "enemy of the state". Reports from CNN and Reuters claimed the Central Intelligence Agency (CIA) believes Salman ordered the murder of Kashoggi, who was killed in the Saudi consulate in Istanbul back in October. Trump says the CIA is yet to actually reach a conclusion. This is all unhelpful for Canada because the nation's largest export is oil and the fortunes of significant parts of some regions are hinged on the outlook for prices. Shenfeld and the CIBC team had previously hoped that with the North American Free Trade Agreement (NAFTA) talks out of the way, the Bank of Canada would have a green light to go on raising interest rates, supporting a recovery of the Canadian Dollar in the process. "A couple of hikes in the first few months of 2019 would see the Canadian dollar appreciate, but we see levels below 1.30 as opportunities to sell the loonie, expecting rate hikes to ultimately come in no higher than current implied pricing, and below the BoC’s latest rhetoric which cited a 2.5-3.5% neutral policy rate range," Shenfeld writes, in CIBC's latest outlook. The Bank of Canada raised its interest rate by 25 basis points to 1.75% in October and said it will go on lifting its benchmark rate over coming quarters, potentially taking the cash rate up to 3.5%. The market-implied Canadian cash rate for Wednesday 09, January is 1.97%, suggesting investors are confidently anticipating another rate rise in January. 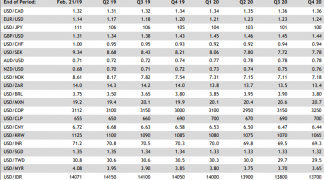 An additional full rate hike is priced in by July, although derivatives markets do not even come close to pricing four full interest rate rises for the 2019 year. "BoC action will be limited as highly-indebted households continue to adjust to higher interest rates. A slowing economy will cause the BoC to lag the Fed, particularly since, even if Ottawa eases up a bit on corporate taxes, the economy will still be seeing fiscal tightening by Ontario and some other provinces. That should see USDCAD settle in the low 1.30s next year," Shenfeld predicts. 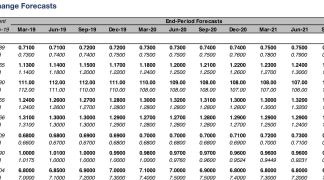 Shenfeld and the CIBC Capital Markets team raised their year-end forecast for the USD/CAD rate to 1.31 Wednesday, from 1.28 previously, denoting the expectation of a weaker Canadian Dollar and stronger U.S. Dollar. 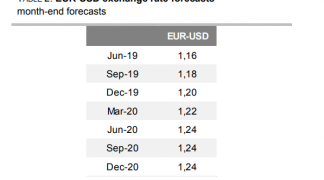 They predict the Pound-to-Canadian-Dollar rate will rise to 1.73 before year-end and that the exchange rate will end 2019 at 1.94. The USD/CAD rate was quoted 0.19% lower at 1.3280 Wednesday, a five-month high, after rising sharply in the previous session. It is up 5.6% for 2018. The Pound-to-Canadian-Dollar rate was -0.33% lower at 1.6958 but has risen 0.13% this year.